New images by NASA's Hubble Space Telescope show that a group of small, ancient galaxies — members of a cluster known as Hickson Compact Group 31 — are just beginning the long process of merging together to form a large elliptical galaxy. Astronomers expect such encounters to only occur very early on in a universe that is evolving from an explosive beginning — the Big Bang. Consequently, according to the Big Bang theory, events of this nature should only be seen many billions of light-years away. The distance to these galaxies, however, is a mere 166 million light-years — which is in our intergalactic backyard. 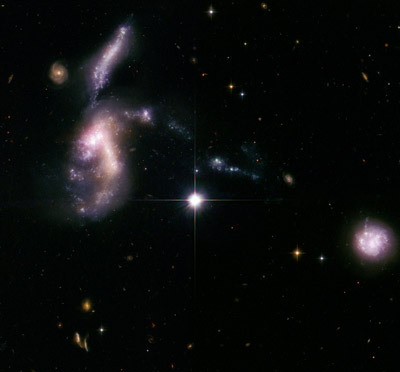 It has been known for some time that these dwarf galaxies are gravitationally tugging on each other. Their classical spiral shapes have been stretched, pulling out long streamers of gas and dust. The brightest object in the Hubble image is actually two colliding galaxies. The entire system is aglow with a firestorm of star birth, triggered when hydrogen gas is compressed by the close encounters between the galaxies, and collapses to form stars. "We found the oldest stars in a few ancient globular star clusters that date back to about 10 billion years ago. Therefore, we know the system has been around for a while," says astronomer Sarah Gallagher of The University of Western Ontario in London, Ontario, leader of the Hubble study. "These galaxies are just coming together for the first time. The encounter has been going on for at most a few hundred million years, the blink of an eye in cosmic history. It is an extremely rare local example of what we think was a quite common event in the distant universe." The scarcity of these events in relatively nearby regions might seem itself to be proof of an evolving universe, but in fact in a non-evolving universe such events would also be rare. This is because galaxies only spend a very short part of their whole lifespan in such a state. In the same way, the percentage of one-month-old babies in any random group of people should also be very low. Everywhere the astronomers looked in this group of galaxies they found batches of infant star clusters and regions brimming with star birth. The entire system is rich in hydrogen gas, the stuff of which stars are made. Gallagher and her team used Hubble's Advanced Camera for Surveys to resolve the youngest and brightest of those clusters, which allowed them to calculate the clusters' ages, trace the star-formation history, and determine that the galaxies are undergoing the final stages of galaxy assembly. The analysis was bolstered by infrared data from NASA's Spitzer Space Telescope and ultraviolet observations from the Galaxy Evolution Explorer (GALEX) and NASA's Swift satellite. Those data helped the astronomers measure the total amount of star formation in the system. "Hubble has the sharpness to resolve individual star clusters, which allowed us to age-date the clusters," Gallagher adds. Hubble reveals that the brightest clusters, hefty groups each holding at least 100,000 stars, are less than 10 million years old. The stars have plenty of gas to feed from. A measurement of the gas content shows that very little has been used up —further proof that the "galactic fireworks" seen in the images are a recent event. The group has about five times as much hydrogen gas as our Milky Way Galaxy. "This is a clear example of a group of galaxies on their way toward a merger because there is so much gas that is going to mix everything up," Gallagher says. "The galaxies are relatively small, comparable in size to the Large Magellanic Cloud, a satellite galaxy of our Milky Way. Their velocities, measured from previous studies, show that they are moving very slowly relative to each other, just 134,000 miles an hour (60 kilometers a second). So it's hard to imagine how this system wouldn't wind up as a single elliptical galaxy in another billion years." Team member Pat Durrell of Youngstown State University added: "The four small galaxies are extremely close together, within 75,000 light-years of each other — we could fit them all within our Milky Way." If the universe is evolving, why did the galaxies wait so long to interact? Perhaps, says Gallagher, because the system resides in a lower-density region of the universe, the equivalent of a rural village. Getting together took billions of years longer than it did for galaxies in denser areas. Whether such a solution is correct remains to be seen, especially given the proximity of the galaxies to our own rather densely populated region of the universe. Gallagher's results appear in the February issue of The Astronomical Journal. Sarah Gallagher's team consists of Pat Durrell (Youngstown State University), Debra Elmegreen (Vassar College), Rupali Chandar (University of Toledo), Jayanne English (University of Manitoba), Jane Charlton, Caryl Gronwal, and Jason Young (Penn State), Panayiotis Tzanavaris (NASA's Goddard Space Flight Center), Kelsey Johnson (University of Virginia), Claudia Mendes de Oliveira (University of Sao Paulo), Brad Whitmore (STScI), Ann Hornschemeier (NASA's Goddard Space Flight Center), Aparna Maybhate (STScI), and Ann Zabludoff (University of Arizona).